After a couple of chunksters (The Diviners, The Woman in White) and some DNFing (Possession) at the beginning of January, I decided to pick up a shorter book that I thought would be a quick read. Voila! 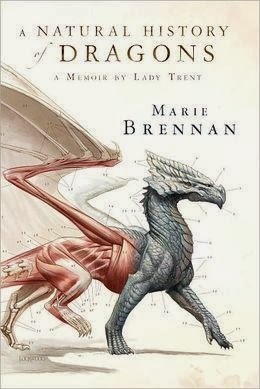 A Natural History of Dragons by Marie Brennan was just the thing. This is a fictional memoir of a natural historian named Lady Trent. I thoroughly enjoyed this mode of storytelling as it helped me sink into this world, and Lady Trent is pretty sassy for a lady of the olden days. Just to give you a bit of backstory, it's set in a fictional world that's heavily influenced by Russian culture. We're talking about a society where women were expected to be demure and enjoy sitting in the house a lot, and Lady Trent is anything but that archetype. She finds a book about dragons...A Natural History of Dragons, in fact...when she's a young girl, and her obsession with the animals only grows. When she ages and gets married, she has an opportunity to set out on an expedition to study the creatures, and a there's a whole lot of adventure going down. I very much enjoyed reading about dragons in this book even though I'm typically not a big dragon fan. It was clever of Brennan to come at this book from the natural history perspective as it takes away a level of cheese that could've been inherent in this story otherwise (for me, anyway). While I did enjoy this book very much, and I read through it pretty quickly, it did not blow my skirt up to the extent that some other books have already this year. It was good enough: 3/5 stars on Goodreads. This is the first in a proposed series of books. I'd read more! Source: Gifted to me from a friend. "Good enough" is how I've typically felt about Marie Brennan in the past. Her books are a fun read, but I don't recommend them with ravey eyes to my friends-and-relations. What else of hers have you read, Jenny? I wasn't familiar with her until this one came along. My sister's the fantasy lover in our family so she might like this one. I don't think it's for me. Yeah, I would recommend this one hesitatingly for someone not really all that into fantasy. I hope your sister likes it if she decides to tackle it! I'm not familiar with this author, but the premise sounds interesting. As for your DNF, Possession sat on my TBR for 9 years. It took 3 tries for me to get through it and ultimately I wrote in my notes that I wouldn't recommend it to anyone. That was before I instigated my "first 50 pages rule," or I might never have made it to the end. Susan, if Possession had been on my shelf the entire time that it's been on my mental to-do list, it would've been 10+ years. I had a copy WAY back in the day, which I culled. Then I bought a clearance copy from Half-Price for this book club read. It'll be leaving the house again shortly. But I am excited to try other books by Byatt. I loved Little Black Book of Short Stories, and the writing in Possession was fine, but all of the fictional academic stuff killed it for me. I'm with Jenny - I generally find Marie Brennan's work interesting but not totally knock-your-socks-off. That said, I did really like this one, and would be interested in more in the series! I have this in my stack and I'm looking forward to it. Amanda, I had a few problems with it. Namely, as a former scholar, I'm kind of over scholarship. lol That is, I don't care much about reading fictional scholarship since I had to read real scholarship for so long. Byatt's ability to write any kind of fictional scholarship that comes across as genuine was amazing, but it sucked my soul a bit. Second, I rarely have a chance to read physical books besides lunch at work and between 6-8:30 when my kiddo is home. This is not a book to be reading whilst one's 3 year old is watching Monster Math Squad. If I'd more hours in the day to sink into it, it might've been a different story. Oh noooo! Maybe it'll pop up on sale? I have 3 of her fairy books, starting with Midnight Never Come, had them for years! and I still haven't read them. I'm encouraged that you found this so good! A quickie that is about a woman who defied societal expectations? Sounds good to me! I've not read her work, but I like the idea of a non traditional dragon book. I love the cover for this book. Seriously. LOVE IT. I'm a dragon fan, so for that alone, I'll have to pick this up. But I also think the premise is pretty interesting! I'll have to grab a copy at some point! The idea for this book fascinates me. Very cool! And the illustrations look beautiful. I keep hearing about this book, and the cover is gorgeous. Not sure if I'll pick it up though, so many other books to read! Plus I'm trying not to start new series. Sounds like a fun book though.